Points After Indianapolis: 11th- one point out of tenth, and 182 points out of first! We are still currently in wild card position and knocking on the door of the top ten again when it comes to the Championship Chase standings! My Mood After Indianapolis: Pleased it was a good points day for Tony! Pleased that it was a good day for Stewart-Haas Racing because Ryan Newman won! I think you could just say pleased all around! This is apparently the post of the exclamation points so you will have to excuse me for that. Apparently I inadvertently gave Ryan Newman good luck last night by posting about him the fact that he not only was on the pole for his home track race but that he did it with a new track record. I also happened to mention his partnership with Oral B Built In The USA and Oral B’s pledge of $100,000 to Hope For The Warriors. So of course the only reason Ryan won was because I happened to post about him on the night before he had raced his obviously already screaming hot Chevy. Hey don’t burst my bubble! Tony Stewart and the 14 crew check out the charts in the garage at Indianapolis Motor Speedway. (Photo Courtesy of Tony Stewart Official Store on Facebook). Let’s get to Tony’s race- shall we? I was thrilled Tony qualified as well as he did. 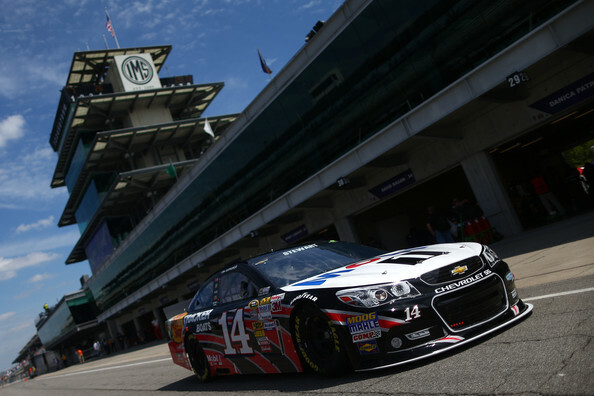 I understand how much Indianapolis Motor Speedway means to Tony Stewart and how important doing well there is as well. I also know that he is not the world’s best at qualifying- I think he would tell you that too. A fifth place qualifying effort to me is almost like getting a pole. I am thrilled. So when the race started all I could thing was PLEASE just have a good finish today…a win would be AWESOME but a good finish was greatly needed for that pesky little thing called THE CHASE that’s coming up in like what six weeks or so? Yeah- I am starting to get heartburn worrying about that but that is a different story for a different day. To my delight- Tony stayed within the top ten most of the day- only falling outside of the top ten during a pit stop when he took four tires and others took two or stayed out. And that was when he went from 11th to 7th in less than a lap. THAT RIGHT THERE meant that Tony had a car he would work with. Of course when I saw him do it I squealed ARE YOU INSANE MAN? But then he didn’t again the very next caution going from 9th to 6th. It was THIS movement that made the race for me- because that car was more than just a little sporty- that car was something he could manhandle if he needed to. Which meant he had a car that could move- and I liked that for him and for the team. Tony finished fourth- and I have always said I consider it a good day if you finish better than what you started- which is exactly what Tony did. The 14 crew heads over the wall to service Tony Stewart’s #14 Mobil 1 Chevy during the Samuel Deeds 400 at The Brickyard. (Photo Courtesy of the Tony Stewart official Store on Facebook). Now let’s talk about the actual “racing action” for a moment. I was a bit taken aback by this editorial by Dustin Long mentioning that because there was only one pass for the lead that the race wasn’t exciting and chastizing Tony for thinking otherwise. I don’t know what everyone else’s thoughts are on this matter- but I thought the race was just fine excitement wise. To me seeing my driver in the top ten was exciting. To me seeing my drivers teammate racing JIMMIE JOHNSON for the win was exciting. To me seeing my driver pass cars for position on the restart was exciting. And it was ALL racing. This particular race- in my opinion was lost in the pits by Jimmie Johnson’s crew. That last pit stop Jimmie Johnson’s pit stop was LONG. Really LONG (by three seconds- which in pit stop terms is ages). And Ryan Newman’s was about 3 seconds quicker. I am pretty sure that 3 seconds gave Newman the buffer he needed to keep Johnson behind him. I was excited for Ryan that he won at his home track for the first time. I have said this before- as a race fan I realize that not ALL races hold the same excitement that others do- but there was no point at which I found myself BORED while watching this race. It’s not ALWAYS about the racing for the lead, about those close by-a-bumper finishes. Not to say that close finishes like that are NOT exciting- they most certainly are. But that is NOT all what racing is about. At least not to me. Am I the only one who feels like this? Maybe I am too old school for myself. 1. Yes I HAD to add The Smurfs to the title. I think the little blue guys gave Ryan Newman luck…or confidence…or something! 2. NASCAR Mobile 13 hosed up for me most of the race- showing Tony in 4th most of the race. The scanner portion of the ap also dropped away after the halfway point of the race. I even restarted my iPhone and it still didn’t come back. Really? Thank GOODNESS I don’t pay for this ap. I don’t suggest you do either- if you are one of the people considering it- it’s frustrating as all get out. 3. Luckily- my scanner access suddenly popped back in with about 10 laps to go and I LOVED hearing Tony so nervous for Ryan during the last couple of laps of the race. He asked for intervals so they started telling him the interval between him and the car behind him (Kasey Kahne). But I wasn’t sure that was what he meant. Then finally he just straight up asked what was going on at the front. How Ryan was doing with his interval on Jimmie. So then spotter Bob started to call the race for Tony- since Tony was pretty much on his own. Of course it was just as much fun seeing Tony in victory lane talking to Ryan’s father and then giving Ryan a huge (surprise) bear hug. Would have loved to hear what they said to each other there. Tony Stewart, Car Owner, congratulates Ryan Newman on his win at the Brickyard 400 in Indianapolis, Indiana. 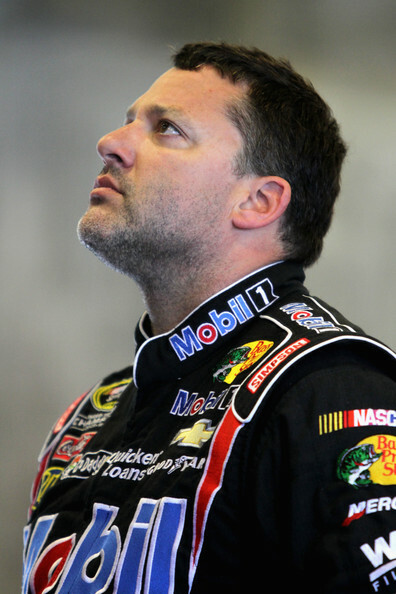 (Photo Credit: Courtesy of the Official Tony Stewart Facebook Page). Next week we are back at the evil little tricky triangle of Pocono.